Ewan MacGregor stars in, and as, "Christopher Robin," a live-action reimagining of the beloved "Winnie the Pooh" stories, written by A.A. Milne. In the new film, Christopher Robin has grown up, forgotten his childhood friends, and started a family of his own. Unfortunately, he now spends most of his time working, so Pooh and his pals have to teach him a valuable lesson about... not doing that. Hayley Atwell ("Agent Carter") and Mark Gatiss ("Sherlock") co-star, along with voice actors Jim Cummings, Brad Garrett, Sophie Okonedo, Nick Mohammed and Peter Capaldi, in a movie directed by Marc Forster ("Finding Neverland"). 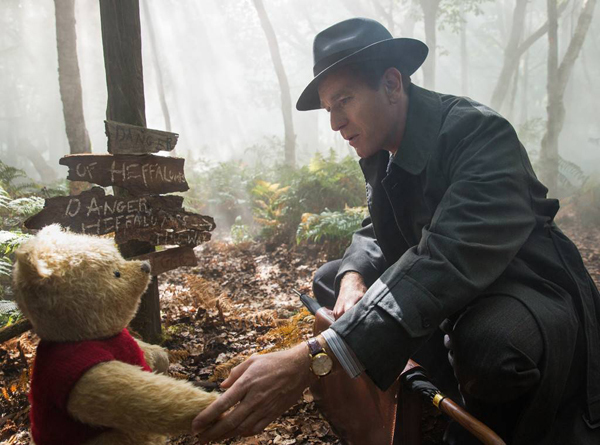 In his review at IGN, William Bibbiani says "When artists worry about what big corporations might do after they buy the rights to their creations, Disney's 'Christopher Robin' is exactly what they're worried about."